14-07-2013 – Released usbpicprog-0.6.0 Check the download page (ubuntu users will get an automatic update through the usbpicprog-stable PPA)! 29-05-2013 – Implemented PIC16C61, PIC16C62, PIC16C62A, PIC16C62B, PIC16C63, PIC16C63A, PIC16C64, PIC16C64A, PIC16C65, PIC16C65A, PIC16C65B, PIC16C66, PIC16C67, PIC16C71, PIC16C72, PIC16C72A, PIC16C73, PIC16C73A, PIC16C73B, PIC16C74, PIC16C74A, PIC16C74B, PIC16C76, PIC16C77, PIC16C620, PIC16C620A, PIC16C621, PIC16C621A, PIC16C622, PIC16C622A, PIC16C623, PIC16C624, PIC16C625, PIC16C710, PIC16C711, PIC16C712, PIC16C716, PIC16C745, PIC16C765, PIC16C773, PIC16C774, PIC16C923, PIC16C924, PIC16C925, PIC16C926. Please test version 130529. 01-04-2013 – Implemented PIC18F1230 and PIC18F1330. Please test version 130401. 27-03-2013 – New installer for windows 8. Please test the 32bit and 64bit version. 07-09-2012 – Released usbpicprog-0.5.0 Check the download page (ubuntu users will get an automatic update through the usbpicprog-stable PPA)! 28-06-2012 – Released usbpicprog-0.5.0-beta Check the download page (ubuntu users will get an automatic update through the usbpicprog-stable PPA)! 28-04-2012 – Merged the branch restructure_code into master. If you upgrade to the latest development version (120428), make sure you also upgrade the firmware! 21-06-2011 – Implemented feedback (percentage) of the programming process in the command line interface. 30-05-2011 – Released usbpicprog-0.4.2 Check the download section! 28-02-2011 – Released hardware-0.3.2 Still using the old hardware? Don’ t worry, just changed some component values for better VPP performance. 27-01-2011 – Released usbpicprog-0.4.2-beta Check the download section! 18-11-2010 – Released usbpicprog-0.4.1 Check the download section! 08-11-2010 – Added Malay translation – Many thanks to Hafidzuddin Mazlan! 21-10-2010 – Added Russian translation – Many thanks to Serafim Nenarokov! 23-09-2010 – Fixed 18F24J10 and implemented 18F2XJ and 18F4XJX devices. See help section for special connection diagram! 13-09-2010 – Released usbpicprog 0.4.1-beta Check the download section! 24-05-2010 – Implemented PIC18F24J10, 25J10, 44J10 and 45J10. Please take in consideration that a 3.3V voltage regulator is needed on the VDD line, as wel as a 100nF capacitor on the VCORE line. The device is not tested yet, please send me test results. 21-05-2010 – Released usbpicprog-0.4.0. Check the download section! 20-03-2010 – Released usbpicprog-0.4.0-beta2. Check the download section! 19-03-2010 – Added some examples (getting started) projects to the installers of the PC application. 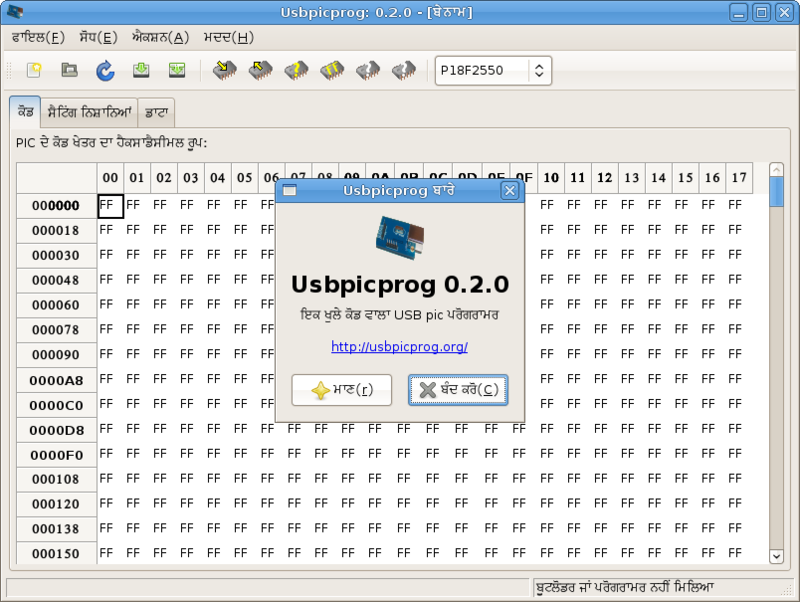 08-03-2010 – Released usbpicprog-0.4.0-beta (firmware and software). Check the download section! 19-02-2010 – Implemented PIC12F508, PIC12F509. Please check the download area for revision 823! 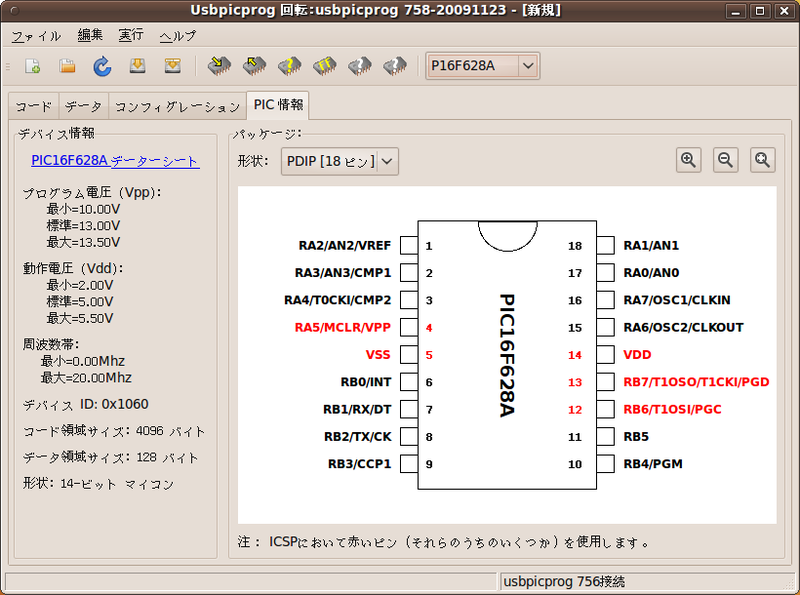 08-02-2010 – The usbpicprog application now uses libusb 1.0, thanks to Francesco for the implementation! 24-12-2009 – Implemented PIC18F1220, PIC18F1320, PIC18F2220, PIC18F2320, PIC18F2331, PIC18F2431, PIC18F4220, PIC18F4320, PIC18F4331, PIC18F4431. Please check the download site for revision 782! 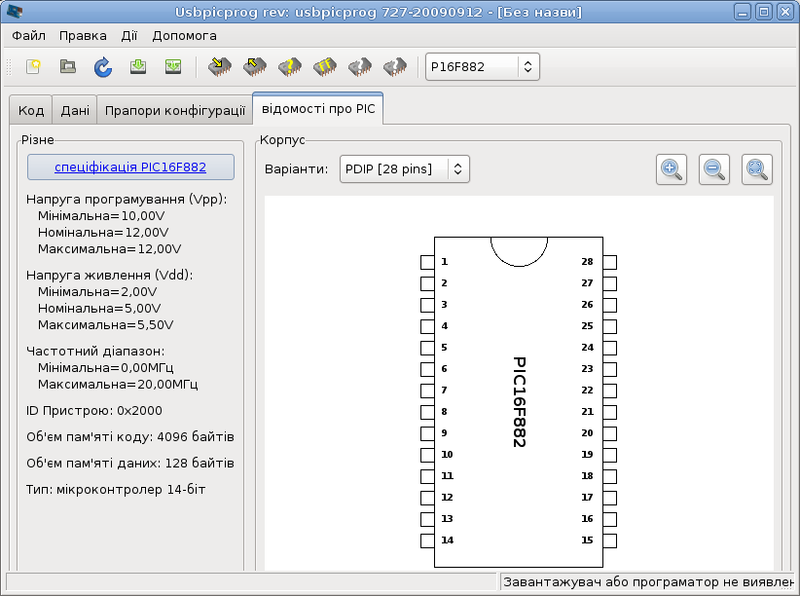 23-10-2009 – Released usbpicprog-0.3.0 (firmware and software). Check the download section! 12-10-2009 – Implemented a fix for the 12F629 family which supports better restore of the osccal register – please test revision 744! 09-10-2009 – Programming of dsPIC30F devices is now working – please test revision 738! 07-08-2009 – Implemented PIC16F54, 57, 79 – please test revision 717! 29-07-2009 – Implemented PIC16F716 – please test revision 715! 24-07-2009 – Released hardware 0.3, check the download section for both the through hole and the smd version of the new hardware! 18-02-2009 – Patrick Nies joins usbpicprog as a developer. Welcome Patrick! 16-02-2009 – Added Czech translation. Many thanks to Jiri Merth! 24-01-2009 – Fixed the build script for Mac OS X. Thank you Jan Paul! 21-01-2009 – Added Portuguese translation. Many thanks to Fábio Silva! 15-01-2009 – Added Punjabi translation. Many thanks to Kanwaljit Singh! 02-01-2009 – Added Greek translation. Many thanks to Jim Black! 31-12-2008 – Added French translation. Many thanks to Patrick Nies! 06-12-2008 – The trunk version of upp_wx is now multi-threaded (merged branch) Thanks to Fransesco Montorsi (frm)! 26-11-2008 – Added the Arabic translation. Many thanks to Hadi Saoud! 24-11-2008 – Made a branch in subversion which will bring Gui improvement and a multithreaded application (branches/upp_wx_thread). Many thanks to Fransesco Montorsi!